Today I write the last post of this month. 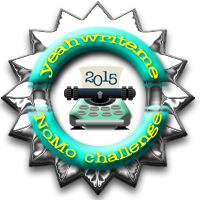 Yes, I managed to successfully write a post for every day of November as part of Yeah Write‘s Writing Challenge – NoMo (November Month). In spite of the Mother of all festivals, Diwali, as well as some health scares by the two men in my life (hubby and baby), I managed to complete the challenge. It does feel good. Goood! The couple of months before November, a sloth had taken over my entire being. Typing out a word seemed arduous as it took every ounce of effort on my part to even press a key! Thinking about topics to write on seemed like a gargantuan task. In fact, the last time I read about a writing challenge, I did decide to take part, but developed cold feet at the last moment! However, all this changed the day I read about NoMo at Yeah Write. Something clicked in my brain, and I decided that enough was enough, and that I was going to take up this challenge, and prove myself wrong about my withering writing skills. And, now that I have done proving, I am going to raise a toast to myself. A vodka, wait let me make it a Bloody Mary…yes, that will be a wonderful way to celebrate! We all need to push ourselves over the limits that we set; unconscious as we are of the fact that we can outdo ourselves! It isn’t easy, but it isn’t impossible either. Fortunately for us, the good people at Yeah Write did give us some leeway by allowing us to post pictures with captions on days when time was hard to find. God bless them! I posted pictures of the Diwali celebrations, as well as pictures of my baby, Chikoo and his buddies. Gave a glimpse of my little world to the big world out there. There were days, when I would sit in front of my laptop, twiddling my thumbs, as ideas failed to make their way to my mind. And, at such times, my dear blogger friends helped out in a big way by suggesting interesting prompts. A blogging community/group can be such a blessing! And, blogger friends, who kept encouraging all through, made it all the more easier to complete the challenge. When I began writing, on the 1st of November, I felt that by the end of it all, I would be letting out a “Phew! I am done! Now, I go on a vacation!” But, now, I feel exhilarated and motivated to carry on writing a lot more – on a regular basis, as well as in different styles. Well, let’s see how well I manage that. I am not going to set any boundaries now, for I know I can do much better than I give myself credit for. So, here’s to myself (hehe) and my blogger friends, who completed the NoMo, and any other challenge they took up! Friends, we did it! Cheers to you all! Bravo to you, Shilpa! You did it! I'll join you for that celebratory drink after I complete my post which I haven't done yet. Just shows what we can do when we put our minds to it, right? I, too, wasn't sure I could post every day but somehow I have managed to do just that despite the challenges that I faced, the biggest, the death of my mom two weeks ago. But the writing has always been therapeutic so it's been good to write about her as some of my posts. Congratulations! We rock!